Green Cord exam at Academie Duello! If you’ve been keeping up with my life, you’ll know that I started at Academie Duello in their Taste of the Renaissance program at the beginning of the month. So for two days a week, I’d head on down to their studio downtown to learn all about rapiers, as well as touch on longswords and the side sword. It was a bit hard to juggle classes at university with the program, but it was also a great way to get away from pure academics! Today we took our green cord exam. The green cord basically means that you’ve gotten the fundamentals of swordplay down, mainly focusing on the rapier. So for people who will be taking the exam, you do not have too much to worry about. Just brush up all the Italian words that they taught in class, go through your checklist on your booklet, and you will be fine. Of course, this means that you should know how to properly execute a well ordered lunge, switch guards, what each tempo looks like and how to advance/retreat. Almost the whole exam is on rapiers, except they sprung out side swords in the last 3 minutes of the exam. We were all a bit confused because it had been a while since we’ve touched the side sword. They’re really nice about the whole thing though, and you take it with everyone else in your class. The examiner will walk around and make sure you’re doing it correctly. I had to do my exam with a fever (I mysteriously got ill at the beginning of this week, just in time for my Transport & Logistics midterm exam, as well as my green cord exam), and it still went pretty well. After playing around with the three different weapons, I must say that my favourite is the longsword. One of my friends there was also telling me how it was the lightest to hold since you get to keep two hands on it. 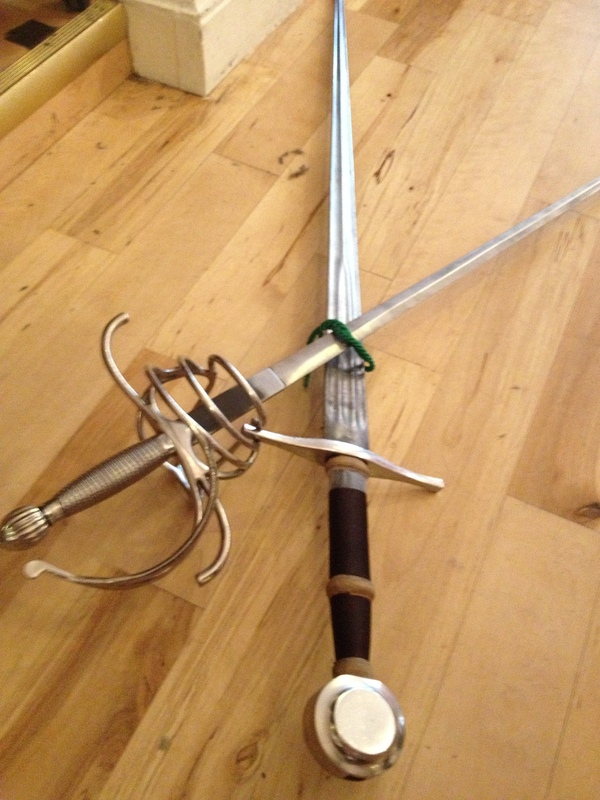 Believe me– even though the rapier looks light, it gets really heavy after a while. 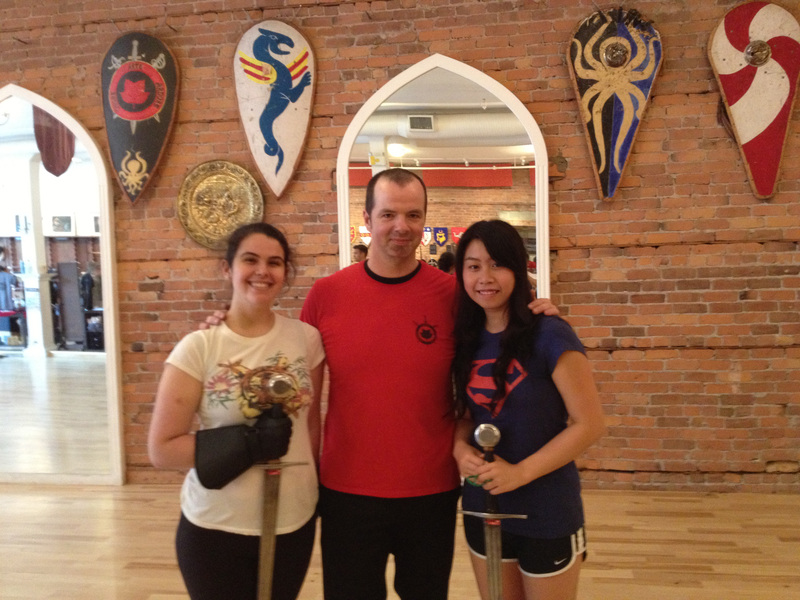 All in all, my experience with Academie Duello was great! I will be coming back after summer (I promised two of my friends I would)! They have really awesome instructors there and everyone seems like one big family. Greg Reimer led us through our eight classes in the program and he is seriously the nicest guy ever. He’s patient and has a great sense of humour, which made the class all that better! I have definitely meet some really cool people in my class and I hope I’ll see them there again some day! Why don’t we have radio sitcoms anymore? Do we get to call you d’Artagnan now? I was fortunate enough to interview a traditional Japanese sword-maker through an interpreter years ago. Such amazing artistry and such a fascinating guy to chat with. Japanese swordplay is definitely something that sounds very interesting!